Probably about ten years ago, I lost my wallet while in Mexico. I was out for a night on the town with my good friend, and we were so busy enjoying the sights and sounds that I didn’t realize my wallet was gone until the next morning. I’m sure you can imagine the feeling of panic that bubbled up inside of me. I’d lost my wallet! How was I going to get out of this one? Thankfully, losing your wallet is nowhere near as scary as it seems. There are so many safeguards in place for consumers who lose their credit cards and identification, but when it happens, it truly feels like a near impossible obstacle to get around. Don’t panic, though. We’re gonna give you the lowdown on what to do and in what order, so that if this ever happens to you (fingers crossed it doesn’t), you’ll know exactly what to do. The first thing to remember is that you shouldn’t waste any time getting these things done. Some people talk themselves into waiting to see if the missing wallet turns up, but if you delay taking these steps, you can make the problem indescribably worse. 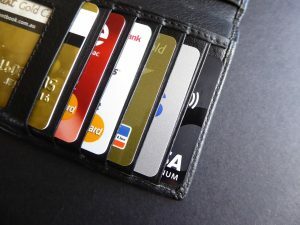 Suddenly, it’s not just a missing wallet you’re dealing with, now you have to fight a case of stolen identity and charges on your credit card that you did not approve. Move fast and get it all done. If the wallet shows up later, just remember, it’s far better to be safe than sorry. Step One: Call all your financial institutions and cancel all your cards. Not just credit cards, either. Call your banks and let them know you’ve lost your debit cards as well. Your lenders and your banks will have new cards out to you as promptly as possible. They don’t want you without a card anymore than you want to be without one. Step Two: Head to the police station and report your wallet stolen. Even if you suspect it’s not stolen, you want to cover your tracks here. A police report will come in handy if someone tries to use your credit or debit card, and will also help you prevent anyone from using your ID and pretending they are you. Your police report can also help you with immigration proving who you are, although I hope you kept your passport separate from your wallet and still have it with you! Keep every document you receive from filing this report close. Step Three: If you have no cash, get in contact with someone at home to wire you enough for the remainder of your stay. Having trouble contacting them or using long distance phone services? No problem! Head to Canada’s closest embassy or consulate and they will help you find your way through this mess. To find one near you, visit this link. Step Four: Get in touch with the credit bureaus that operate in Canada and let them know what happened. This is called a fraud alert, which means that for 3 months, security steps are added to the process of opening up new lines of credit. For Equifax, head here. For TransUnion, head here. Step Five: When you get home, request your credit report from both the Equifax and TransUnion credit bureaus, so that you can pinpoint anything suspicious that may have happened using your identity. For Equifax, click here. For TransUnion, click here. Step Six: Visit driver’s services and get your driver’s license replaced. You should get a temporary one the same day you stop in to get your replacement. Step Seven: Replace any other ID you may have had in your wallet, including your birth certificate, your citizenship card, or your health card. To replace your birth certificate, click here. To replace your citizenship card, click here. To replace your health card, click here. Plastic SIN cards have been discontinued in Canada, so there is no need to replace that. That's it. You're done! You see? It’s not so scary, after all. Sure, there are a lot of steps, and you’re in for some paperwork, but it’s not something you can’t handle and nothing has been truly lost, save for the cash and photos you may have had in your wallet. When all is said and done, it’s a hassle, but it’s not the sort of hassle that needs to ruin anyone’s vacation, so get these steps done, slap on some sunnies, find your spot on the beach and grab yourself a margarita. You’re on vacation while the rest of us poor sods are still toiling our way through another ho hum Thursday. Have you ever lost your wallet while out of town? Let us know in the comments how it turned out!